Want to change your company’s safety culture? In 2002 Higbee & Associates opened the North American Management Institute as a division of Higbee & Associates, Inc. While the core competency of the organization until that time was safety performance we had started helping organizations going through significant changes. Today we are actively helping organizations plan and execute those complex change initiatives that tax an organizations structure. 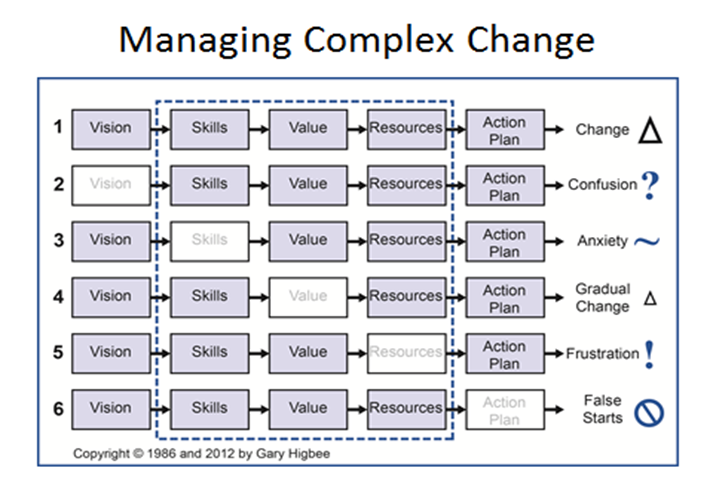 There are five critical components that must be dealt with to assure a successful change. If you leave any one of these five components to chance you risk either a failed initiative or an ineffective initiative. Vision – Everyone in the organization needs to be aware of what is being changed and why it is imperative. This requires an accurate assessment of where they are today and exactly where the organization needs to go. The vision proposition is more than simply making a change to improve the organization. The ability to change is required for the very survival of the enterprise; however the status quo is a very comfortable place to be so everyone needs to know why the status quo isn’t good enough and why we have to change. This message has to be articulated well, and while the vision often comes from upper management in reality the vision can come from any level of an organization. The vision has to create a picture of what this organization will be or look like in the future. Many years ago, I worked for a large manufacturer that hired a very energetic and intelligent CEO. He had a number of ideas about changing the engineering and design process as well as the marketing method. His ideas may have been successful but he failed to make the case for his initiatives. The organization failed to embrace his vision and his initiatives failed. He failed to establish the why factor. The organization was eventually bought by a competitor and his failure to articulate a coherent critical change was one of the issues leading to the organizations demise. Without vision there is no compelling reason to change and no trust in leadership. Action Plan – Now we skip over to the right side of figure one. Here we are going to develop a plan of implementation. This has to be specific to the vision. If the vision is true everything has to point to and assist the accomplishment of the vision. What do we need to do to meet the vision statement? The plan must include input from all affected parts of the organization to avoid surprise issues. This will be the road map to success. Without a plan the initiative may actually stop, some call this a false start. False starts lead to the next flavor of the month and grasping at straws. This happens way too often. Even the best ideas will fail when the execution is not planned well or done well. We were asked to help another manufacture understand why a change initiative took too long and another competitor used the delay to position themselves as the leader in the market even though the organization had over a year head start. There were other issues but the one that caused the most delay was the failure to agree on a plan that played to their capabilities and strengths. It took too long to develop the action plan and the manufacturing changes took too long. The other organization was first to the market and established their position as the market leader. performance. Most of the time we do a fair job articulating a vision and putting together an action plan but we often fall short in the areas of human performance. Skills – The people required to execute the action plan must have the skills required to accomplish the work. If the needed skills are not present in the current workforce they will need to be trained. An additional option would be to hire employees or temporary help that does have the skills. Without the necessary skills employees will become anxious and may actually produce work designed more to protect themselves not to accomplish their part of the action plan. Employees want to do a good job but if they lack the skills necessary to execute the action plan they become very anxious. This anxiety can lead to faking performance to avoid doing something they lacked skills for. Now we will discuss resources next saving value for last. Resources – The resources needed to complete the action must be provided by management. These resources include not only financial support but also work hours and equipment as needed. Asking someone to perform a task without providing at least the minimum required resources is setting them up for frustration and maybe even anger. Value – We saved value to last for a reason. The value is actually just a perception of those involved in any way with the change. The value will be self-created and it can be negative or positive. If the planned result will help the organization meet its goals and those goals are worthy of the effort required the employees the change will happen and happen quickly. They will not only see the value of the change but they will actually embrace the change. They will feel a sense of pride and accomplishment that only comes from a team effort. They are also ready for the next challenge – bring it on. If the value perception is negative the change initiative can still be accomplished but it will take a lot longer to accomplish. If the time is long enough the change may not be accomplished in time to have its desired result. You will notice that there is a dotted blue line that surrounds ‘skills,’ ‘value’ and ‘resources’. The dotted line was drawn around these components to indicate that these three components are the most troublesome. If the change effort fails, it’s likely that one or more of these three was responsible for killing or damaging the effort. When any area is not covered well it leads to an issue. Look at figure once again and the top line represents a success change initiative. All five components are shaded in and the result is the change you were striving for. The next five lines all have one component that was not completed successfully. That component is not shaded in and the right side column gives us the result when that component has not been dealt with. There is a natural resistance to change for a large part of the population. In my opinion this apprehension to change has developed more because of the large percentage of change initiative failures rather than the difficulty or magnitude of the task. No one wants to waste their time let alone be inconvenienced. However, most change initiatives do fail or come well short of the original objective. They are a lot of work for the small percentage that succeed. The good news is that if the change initiative does succeed there is a huge pay off. Many change initiatives come from the top leadership of the organization. I have seen data that suggests the highest ranking person in any organization, on average, moves on to another job within the organization or moves to another organization after about three and a half years. If that is true and the change is being driven by that individual then one might assume that if we resist hard enough or stall long enough this change initiative will pass.